View More In Capacitance & Resistance Meters. 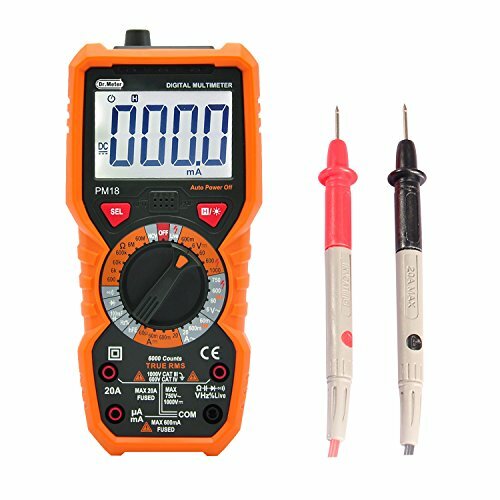 The Dr.meter PM18 Multimeter is a powerful digital device that can accurate measure AC/DC voltage and current, resistance, diode, transistor, continuity, frequency, capacitance and live line test. It is packed with advantageous features such as NCV detection, back LED light and backlit large LCD screen, greatly enhancing its functionality and performance. A compact and handy device to pinpoint everyday electrical issues around the house with safe and user-friendly operation. - Sampling rate: about 3 times/second. - Polarity indication: "-" auto displayed. - Please remove the test lead and cut off the power before replacing battery and fuse. If you have any questions about this product by Dr.meter, contact us by completing and submitting the form below. If you are looking for a specif part number, please include it with your message.